You are empowered from on high. Never forget your Source. I AM the only true light, and there is no substitute. A counterfeit is known by knowing so intimately what is true that a lie cannot deceive. So bring My light, let it be known in all the earth that no counterfeit or substitute would even be a temptation to those around you because the vibrancy and warmth of My light is irresistible. You are My light. Seek out My inheritance. Display My glory for all to see. Rejoice in Me and shine My light to the nations. Shore up the places where the enemy has sought to quench or dispel it. Replenish the generations that have been lost in the darkness. Ignite the little ones that they might shine brightly too. My light burns brightly. It will never be quenched. You operate in My authority because you are Mine, and I delight to go before you strength and power. You carry My light, so shine. Joshua was a mighty man of valor, and just like Joshua you have been prepared for this time. You are being given the vision and the strategy. You are being commissioned and sent forth to claim the inheritance that the YHVH Saboath (The Lord of Hosts) has given His children. Walk forth into your destiny and be empowered by the Spirit of the Lord Most High. A prophetic word from Chuck D. Pierce and Deborah Degar from the Elijah List is connected to this. It is called “Let Me Strike You with My Lightning: Enter into Your “Conducting” Season!” (http://www.gloryofzion.org/docs/1-29-18_Sound.html) This word speaks of God empowering His people – sending lightning from heaven to do so. 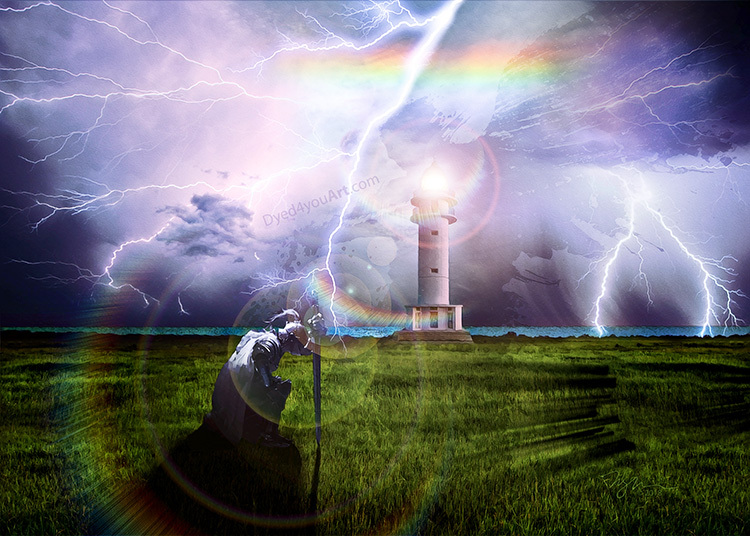 It encourages that “If you will allow Me to make you My lightning rod, I will cause you to be one that will conduct power.” He is looking for those who will be in agreement with Him and are ready and unafraid to walk in His power. In Hebraic thought, darkness is “obscurity”. Darkness hides things. This isn’t bad or good, it just is. Scripture says that God covers or hides Himself in darkness. (Thus the Shadow of God.) Treasure is often hidden in basements and in darkness. However, man also hides in darkness in the wrong way. (Sin.) Nothing is hidden from God’s sight. And at the end of the day, WE are His treasure. When we are in His shadow and see through His eyes, that which is hidden becomes plain to us. We can learn to see past the darkness and see what is being obscured. A testimony from Elisa Eaton of Waiting in the Wings is connected to this. One morning, He finally gave me understanding. He showed me that I was discerning evil spirits but just in a new way. The odd thing was the way I perceived them. I knew I was seeing into the second heaven. And I knew that the second heaven was supposed to be in darkness but everything was completely light! There were also other aspects of clarity in these visions as well that made the darkness less frightening. I understood that I was seeing the second heaven and the spiritual atmosphere through God’s eyes. To Him, even the darkness is as the light. A little while later, the Holy Spirit began praying through me. I was praying over the darkness I had been discerning. In the Spirit, I suddenly saw this gross darkness; it was like a black fog. The Spirit gave me the words to pray—the request was that God would create an opening within the darkness and light the path for those trapped in it. I asked for a path to be laid in mercy that would lead people to Him. I saw the darkness split almost like the Red Sea. It opened up a path, and where the path was it was like bright daylight! Angels stood along the way holding back the darkness. I also saw golden tokens lining the path, almost like breadcrumbs. The tokens looked just like an Israeli coin I wear as a necklace—the agorot which has the menorah on it. With the passage of time, I came to see that I wasn’t just praying for the people around me, I was also praying for myself. Although my circumstances were spiritually dark and heavy, God had no trouble seeing the path I needed to take out of these circumstance. He also didn’t have any trouble protecting me in that gross darkness. I was an intercessor who had been sent into the darkness but God gave me His eyes, His perspective, and the light of His Word to see by. Deuteronomy 32:11-12 (NKJV) As an eagle stirs up its nest, Hovers over its young, Spreading out its wings, taking them up, Carrying them on its wings, So the LORD alone led him, And there was no foreign god with him. What or who can stand against you when you are filled with Me? Where is the purpose in being afraid? Does light tremble in fear darkness may overcome it? Never! Be confident, bold, and steadfast as you walk as a child of the Light. Beloved, when you are in the midst of dark and turbulent circumstances, it is important that you do not lose sight of who you are in Me. You are light and you are salt. You are My emissary and a priest anointed for war. Wherever I send you, I work through you to shift atmospheres, preserve life, and overthrow all the powers of darkness. Your commission comes with its challenges but never forget, beloved—light overcomes the darkness, not the other way around. In every circumstance My presence goes with you to assure your victory for the Kingdom. We have come through many battles together and you have come to experience My keeping power. Therefore, wherever I send you, walk in holy boldness. Cast down the lies that fear and intimidation bring to hinder My purposes through you. No situation is too hard for Me and no storm is too dark and thunderous for Me to guide you through. Gird yourself with the knowledge that absolutely nothing is too hard for Me. The name of the silk hidden in this image is He Moves in Power. 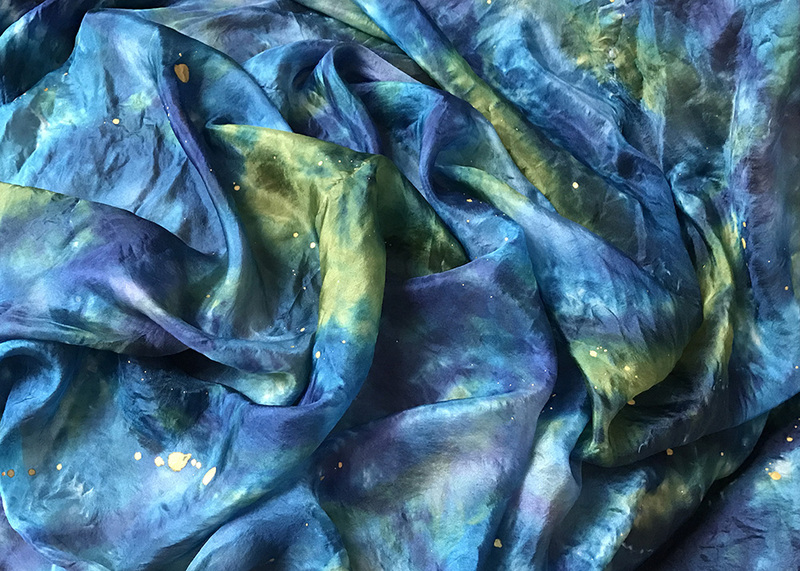 The colors in it are sky blue representing open heaven and spiritual realm, peacock blue representing fullness of His flow, pea green representing new life, deep dark blue representing deep mysteries and presence of God(Psalm 18:11), and gold shimmer representing glory and power of God. Father, thank You for being light. Thank You for bringing clarity and direction. 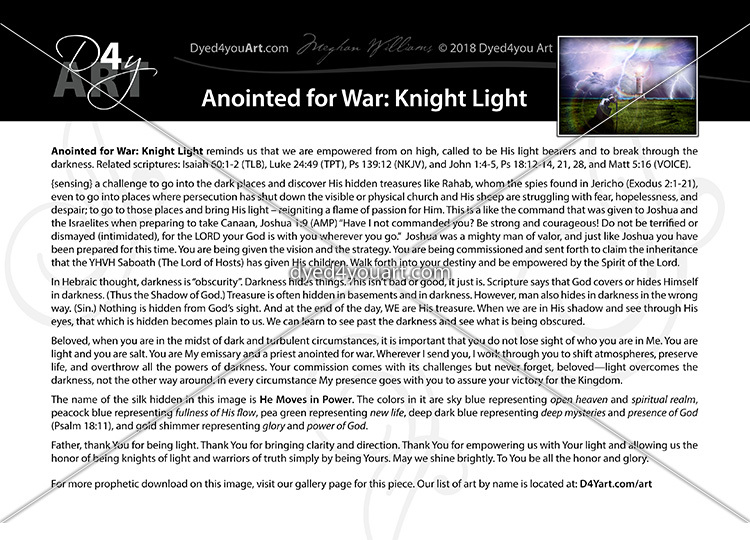 Thank You for empowering us with Your light and allowing us the honor of being knights of light and warriors of truth simply by being Yours. May we shine brightly and make You proud. To You be all the honor and glory.